Decision (2012, NR, 90 Mins) A family in despair rediscovers its faith in this uplifting drama from the producers of WWJD: What Would Jesus Do? Natalie Grant (Four-time GMA Dove Awards Female Vocalist of the Year) stars as Ilene, who struggles to make ends meet after the tragic death of her firefighter husband (country music star Billy Dean). When she begins to lose control of her heartbroken teenage son Jackson (Michael Rosenbaum), she reaches out to her estranged father Wyatt (Rusty Whitener), a farmer, to take in the troubled boy. Wyatt is a good man but set in his ways, and Jackson resists Wyatt’s attempts to instill in him the virtues of hard work and his Christian values. Gradually, they form a bond that will require Jackson to find an inner strength he never knew he had to avert yet another family tragedy. God's Country (2013, NR,91 Mins) Beautiful and ambitious investment banker Meghan Doherty has an assignment to close a deal that could make her career. All she needs to do is travel to the Mojave desert and get the land rights for God’s Country, an isolated Christian retreat in foreclosure. But the faithful minister who owns the property refuses to consider her offer until she agrees to spend six days learning about his ministry. Reluctantly, Meghan trades her stilettos for hiking boots and slowly comes to realize the value of what the rural camp has to offer. Starring Jenn Gotzen, Daniel Hugh Kelly and Michael Toland, GOD'S COUNTRY shows that, with faith and love, it is never too late to learn where real riches can be found. 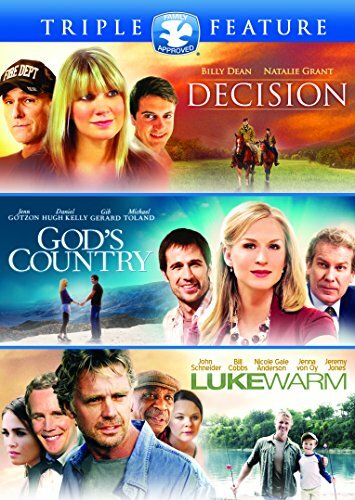 Lukewarm (2012, NR, 97 Mins) Luke Rogers (Jeremy Jones, Decision) started out on the right path, but when his dad (John Schneider, What Would Jesus Do?) walked out when Luke was just a boy, his world came crashing down. Now working as a bartender to make ends meet, Luke is slowly losing his way. Between the enticements of the nightclub scene and a reluctance to fully commit to his devoted girlfriend (Nicole Gale Anderson, “Jonas”), Luke’s crisis of faith is coming to a head. Will he ultimately succumb to temptation or can he take control of his life and try to forge a new bond with his estranged father? Featuring a great cast including Jason Burkey (October Baby), Jenna von Oÿ (“Blossom”) and Bill Cobbs (The Ultimate Gift), and a universal message of hope, LUKEWARM is an inspiring tale of faith, forgiveness and redemption.